﻿ Sonderbooks Review of No Fair! No Fair! Review posted January 14, 2019. Orchard Books (Scholastic), 2016. 32 pages. Oh this book made me laugh! It compelled me to read it aloud, first to people at work, then even when I was home alone. 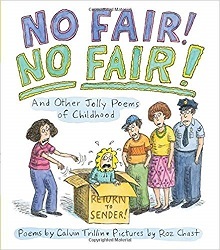 This is a book of poetry in the tradition of Jack Prelutsky and Shel Silverstein -- rhyming poetry about the logic and illogic of children's lives. To do what we would like to do. The Grandpa Rule is in effect. Here's the beginning of "Who Plays What?" And Claudia's always the queen? Diseases that could leave me with two different kinds of lumps. But can't they put the needle into someone else's arm? If so, my older sister is the person I'd prefer. Could Jenny get this shot for me? I've done so much for her. "Okay, my friend, it's time for bed." You still won't let me stay up late. I'll say, "I'm eight," but you won't care. No fair, no fair, no fair, no fair. I have to admit, a few of the poems didn't quite work as well read aloud -- but the majority are so well done, they compel reading aloud. And Roz Chast's pictures are the perfect companion! She gets a child's eye view of the world just right -- with that touch of cynicism and humor in every one of her pictures.